Everybody has been talking about the start to the year that U.S. equities have had, and for good reason. January saw the asset class’ strongest monthly performance in more than five years. But if we’re going to talk about strong areas of the market, we need to start with emerging markets. The iShares MSCI Emerging Markets ETF (NYSE: EEM) actually outperformed the S&P 500 by nearly 2.5 percentage points in January. And despite cooling off slightly in February, the index is still up 8 percent year-to-date. For emerging market investors, this recent rally is sorely needed as EM equity took a beating in 2018. 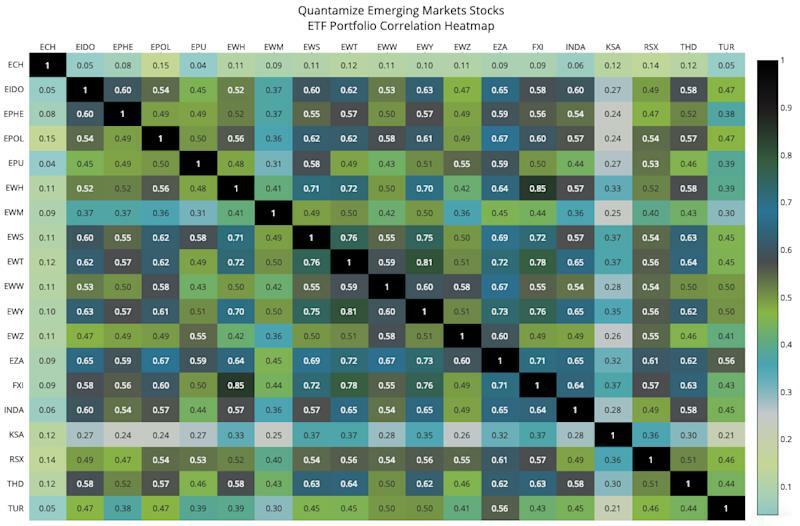 Using the Emerging Markets Stocks ETFs Q-Folio—an AI-based portfolio model from research platform Quantamize—we can see which emerging markets we should consider going over- or underweight in our portfolios. Let’s start with a quick look at all 20 ETFs in the Q-folio. The ETFs in each of Quantamize’s AI Portfolios are adjusted at the start of each month, so these ETFs represent the AI model’s most appealing portfolio makeup as of February 1. The Q-folio’s exposure reveals exactly which emerging market countries hold the most promise according to Quantamize’s AI model. At the top spot is iShares MSCI Saudi Arabia Capped ETF (NYSE: KSA) with nearly one-fifth of the portfolio’s weight. 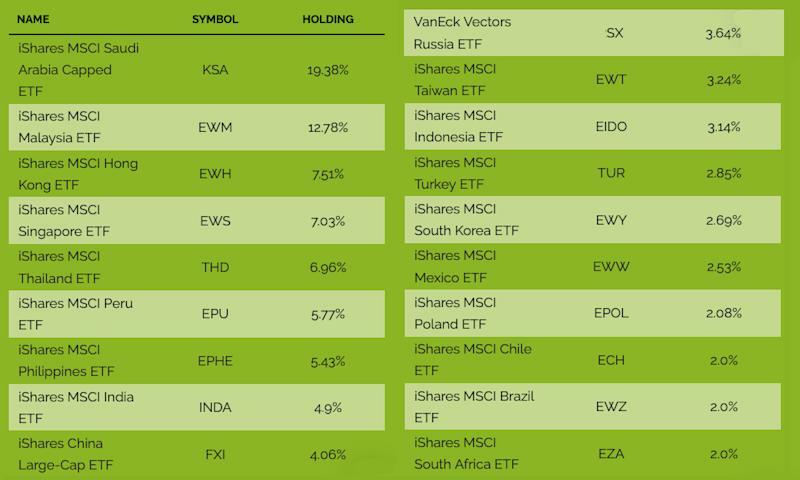 At 10.5 percent YTD, KSA is among the best performing of the portfolio’s top holdings. This strong showing is likely the result of an ongoing oil rally that makes up much of the country’s economic exposure. Apart from Saudi Arabia, Southeast Asian stocks dominate the top holdings. Performance-wise, the iShares MSCI Malaysia ETF (NYSE: EWM) is up 5 percent YTD, iShares MSCI Singapore ETF (NYSE: EWS) is up 9 percent YTD and iShares MSCI Thailand ETF (NYSE: THD) is up about 8 percent. Want AI stock insight and multi-factor portfolio analysis? Click here to learn more. As a side note, it’s interesting to see the position taken up by the iShares MSCI Hong Kong ETF (NYSE: EWH), which is up more than 11 percent YTD. Not only is it the third heaviest-weighted ETF in the model portfolio, but you can see in the table below how closely it correlates to Southeast Asian economies. If you look at the correlation for EWH (sixth column from the left), you’ll see a few deep blue squares where EWH intersects with EWS and EWT (eight, nine, and 10 rows down respectively). This suggests a high-level of correlation between Hong Kong, Taiwan and Malaysia, slightly edging out EWH’s correlation with iShares China Large Cap ETF (NYSE: FXI). 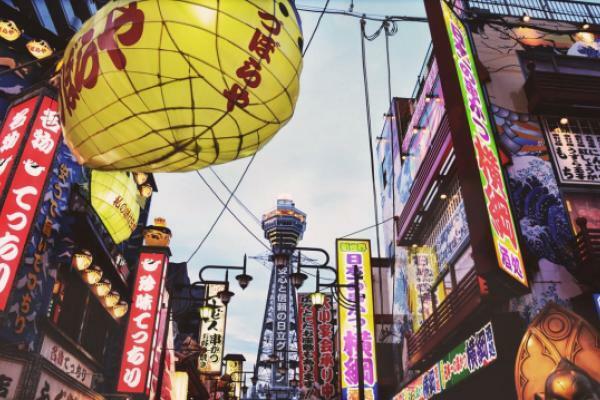 All told, Quantamize’s Emerging Markets Stocks ETFs Q-Folio advises that any emerging markets portfolio should be overweight smaller emerging markets like Saudi Arabia and Southeast Asia, specifically Malaysia, Hong Kong, Singapore, and Thailand. Those five markets account for more than 50 percent of the model portfolio. On the other hand, South Africa, Brazil, Chile and Poland, Mexico, South Korea, and Turkey should all be significantly underweighted, as those account for a mere 16 percent of the model portfolio.